Training workshop for Resellers hosted by eZee Malaysia. Welcome to eZee Insider, your monthly gateway into all things eZee. 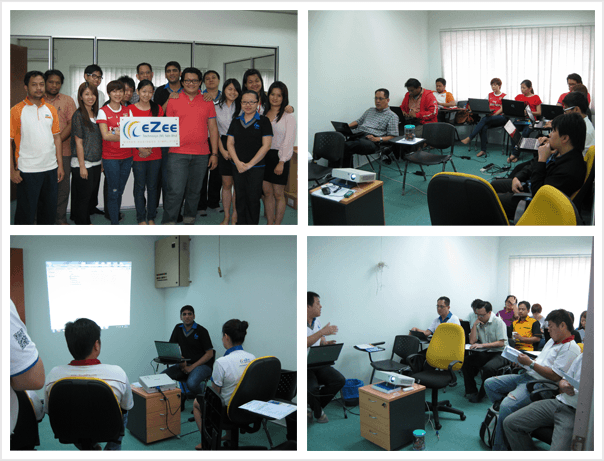 In this edition, eZee Malaysia holds a training meet for resellers in the region. eZee Centrix becomes the first Channel Manage to have two-way XML connectivity with top 4 high performing OTA's in India and eZee iFeedback in live environment. eZee Malaysia team, hosted training workshop at regional office located in Kuala Lumpur. Twenty plus people attended the event with various partners travelling from states of Malaysia, Singapore, and Indonesia. The three-day training workshop which took place on 18th, 19th and concluded on the 20th of September provided participants in-depth insight into eZee's current software line up, training and further highlight eZee's growing portfolio products. Aeijaz Sodawala, Head of Operations in the region, hosted the program covering pre-sales training, individual product features, and new integrations. One of the key goals of the workshop was to strengthen relationship with partners, provide interactive learning process, and enhance knowledge of eZee products. Speaking on the success of training program, Suhel Motiwala, Regional Manager – eZee Malaysia said, "The right knowledge and training is critical for success eZee and our partners in the region. The feedback has been immensely positive and we will continue running such workshops like this in the future." Going by the positive response received, eZee plans to hold such events on quarterly basis in the future with more reseller partners in the future. eZee Centrix, the channel manager has successfully completed two-way XML connectivity with four major distribution channels MakeMyTrip, TravelGuru, ClearTrip and GoIbibo and becoming the first channel manager to do so. India is one of the hottest tourist destinations in the region and the number of people doing online booking for their travels has significantly increased. The four distribution channels have one of the highest penetrations in the Indian market today when it comes to online booking and distribution. The two-way XML connectivity with channels brings many benefits for the hotels who are distributing their inventory across many channels. In today's digital age, it is very critical for the hotels to engage with customers across multiple channels and XML technology plays a vital role for strengthening the relationships. One of the key things hotels have to be conscious about is the importance of real-time updates and quickly lay out new strategies accordingly in order to pinpoint the most profitable customers. XML technology helps hotels to integrate their different systems giving them a better control over their rates and inventory management. eZee Centrix now has more than 50plus channels with two-way XML connectivity at this point in time and we are continuously working with new channels further expanding our global reach. A Prominent group consisting of 10 luxuries apartments implements eZee iFeedback. The group represents one of the most diverse ranges of apartments covering fully furnished apartments, service apartments, and villas catering to varieties of travelers. eZee iFeedback was organically adapted into their live business environment with easy integration with eZee FrontDesk used by them as their Property Management System. This allowed the system to send auto emails to guest upon check out without the staff having to worry about taking feedback from them manually or keeping any kind of track of the guests. This greatly benefited the staff and the organization, as the staff was able to concentrate on task on hand, and the management received the data automatically in the system for analysis. Management comes to know about many aspects of their business operation, staff performance and their offering. Given the nature and scope of the operations, staff at times are not able to pay attention to minor complains and issues which guests face. Feedback system not only allowed to resolve those minor issues but also enabled them to serve their customers better. Further strengthening their overall feedback process, staff member with rights are able to login according to convenience at anytime to view progress of their respective surveys and manage accordingly. eZee iFeedback web-based system which made it easier for the staff to access the system from anywhere and with custom privileges allowed the specified staff to receive the data collected and automatic alerts respectively. Within few days after the implementation, the responses were quick. Black Orchid Resort, a well-known resort in Belize has implemented eZee FrontDesk as their property management system and eZee Reservation as their online booking engine. Belize is one of the premium ecotourism destinations in the world and Black Orchid Resort provides accommodations with an ambience of eco-friendly luxury. Resort offers one of the best locations to stay in Belize City and offers tones of activities such as diving, snorkeling, deep sea or flats fishing, etc. eZee FrontDesk provides the resort with a flexible yet simple to use system for efficiently managing their daily operations and keep up with the highest level of customer service set by them. eZee Reservation will naturally fit into their website and provide travelers to book their stay with the resort with minimum fuzz and increase resort's direct bookings. eZee FrontDesk with seamless integration with eZee Reservation will provide a strong foundation for the resort to operate more efficiently and allow staff time to focus on their customer service. Saigon South Hostel, a group of four hostels located right in the backpacker area in Ho Chi Minch City, Vietnam has implemented eZee FrontDesk as their PMS and eZee Centrix as their Channel Manager. The four hostels are well known among regular backpackers in the region and famous for great service and amenities. The hostels are conveniently located is just 15 minutes away from the most famous attractions in the city such as Reunification palace, War Museum, etc. and provides backpackers everything they need when staying in the city. eZee FrontDesk with its customizable options will manage their daily operations and provide central system where they will receive their online bookings from various channels. eZee Centrix on other hand will take care of their online bookings with a single interface which will enable to manage their rates and inventory across all their distribution channels. Meeting every requirement of hostel's everyday operations and their IDS/GDs connectivity, eZee hopes to build a long-term relationship and provide them with highest level of customer service.